ArchiCAD Training | The Last Step – Make Your Work Count – Keep It Safe! NEW! Comprehensive ARCHICAD Best Practices 2020 training course plus coaching program – special intro offer! These resources will help you get the most out of ARCHICAD! 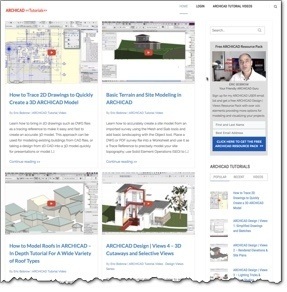 NEW – ARCHICAD Tutorials Website! by Eric Bobrow & Other Leading Experts! Learn to use and master ARCHICAD with helpful tutorial videos & articles. Free educational resources by internationally recognized experts including Eric Bobrow and veteran users from around the world. NEW website just launched - January 2019!! Check out my large collection of free ArchiCAD tutorials on this website. See this page for a summary and guide, or simply explore the menus above. Enjoy! A robust and fully customizable office standard for ArchiCAD that embeds Best Practices into the project structure. 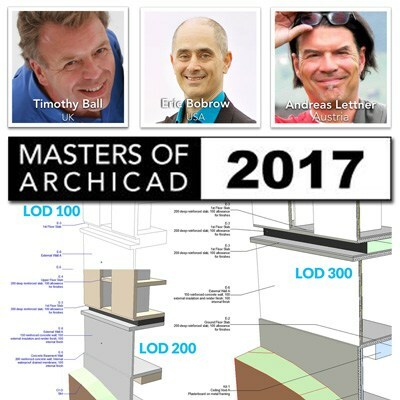 Created by ArchiCAD Masters to help you Master ArchiCAD! ARCHICAD experts team up from the USA, UK and Austria to teach an ambitious online training course over 8 months, sharing their knowledge and experience with users around the world. A complex 60 room hotel design on an Austrian hillside (adapted from a real-world project) will be developed and constructed from concept through working drawings, integrating BIM data for cost and quantity analysis, specifications reporting, IFC-based consultant collaboration and presentation renderings. The new program (taught by Austrian architect Andreas Lettner, UK architect Tim Ball and myself) launches July 12. See full details in the press release (link above). Promotional pricing on ARCHICAD 21 training and MasterTemplate is available on that page for a limited time. I need to upgrade my template to 21 as well please. Let me know, I am a subscribed member. Thank you as always and keep up the great work you are doing for all of us.